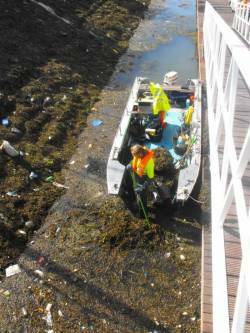 The Latest News from Harbour Clean - the shallow water specialists. Landscaping work to the site – near to the River Ancholme towpath – will coincide with the town’s annual spring clean. Community groups and officials will tidy up the town on the evening of Thursday 23 May. 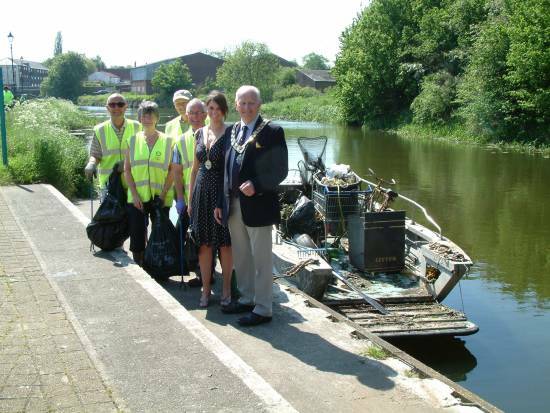 Their efforts will be aided by waste control firm Harbour Clean who will be paid £XXXX to clean the area of the River Ancholme between May and September. Town clerk Jeanette Woollard said: "Harbour Clean will do four days work in May because it is the first one of the year." Brigg Town Council took action to address the build up of litter that was blighting the River Ancholme. Groups signed up to take part in the annual spring clean include the Rotary Club, scouts, cadets and around 12 members of the public. Harbour Clean, the shallow water maintenance specialists, have been praised by local residents and the town council, for their recent efforts to keep the River Ancholme clean in Brigg, Lincolnshire. Utilising their versatile landing-craft workboat Nirvana, the contractor has so far removed in excess of 5 tonnes of floating and submerged debris and rubbish from the spur of the river as it runs through the town centre. As reported by the local Scunthorpe Telegraph, concerns have been raised at the level of fly-tipping in the River Ancholme. Residents have reported an increased amount of rubbish in the river – despite town councillors spending £6,000 for the river to be cleaned. Harbour Clean first cleaned the river on May 26, in works that coincided with the town’s annual spring clean of the river. Residents welcomed the move by the town council to spend the money on cleaning the river but were disappointed with the fly-tipping issues. 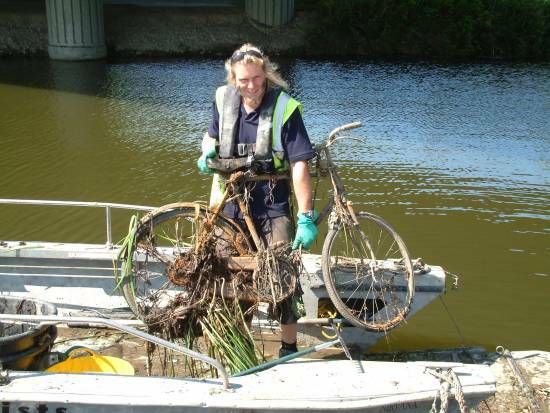 Harbour Clean has been praised for its efforts in cleaning up the River Ancholme with positive observations made of its work. Jeanette Woollard, Brigg Town Council clerk also said the river cleaning was going well. ’Harbour Clean reported back after their second visit and a lot of people have said it is looking really good,’ she said. Users of the River Ancholme have welcomed the announcement that the town council will spend £6,000 cleaning the water way. The work will start at the end of May and will be followed by monthly visits by waste control firm, Harbour Clean, to clear the river of rubbish. The river has been described by one town councillor as the jewel in Brigg’s crown and the work will aim to keep it that way. The start of the cleaning project will coincide with the town’s annual spring clean on Saturday, May 26, where groups of volunteers will take to the streets and river bank. There will then be monthly visits by the contractors until September. Peter Keel, from the Glanford Boating Club and member of the Ancholme Users Group, said: ’It will definitely be welcomed. ’The other day I was out on a boat and went down as far as South Ferriby. ’I was amazed at the amount of plastic floating around in the river. Town councillors agreed that action was long overdue and would benefit everyone in the town. Councillor Anne Eardley said: ’People have been asking for this to be done for 30 years now and it is about time we took responsibility and stopped passing the buck. ’Over the years, it has gone from bad to worse. Councillor Alec Depledge, organiser of the town’s community led plan, a scheme that aims to map out the town’s future, said the issue of waste in the river was a recurring one when he spoke to residents. The river and its condition was by far the biggest concern of residents when we were consulting about the community led plan,’ he said. Councillor Ben Nobbs said: ’We have tried to get volunteers to do it over the years with little success. The first set of works this month will cost £1,898 and will include four days of cleaning. Cleaning works will then take place each month for two days until September at a further £948 per visit. Marina World: "Mobile Clean-Up Service"
The authoritative and market-leading publication Marina World (Nov/Dec 2010) has highlighted the marina environmental maintenance services offered by Harbour Clean. In the publication’s showcase of innovative Products and Services, MW states ’Marina operators in the south coast of England are taking advantage of a new clean-up service offered by Portsmouth-based company, Harbour Clean’. 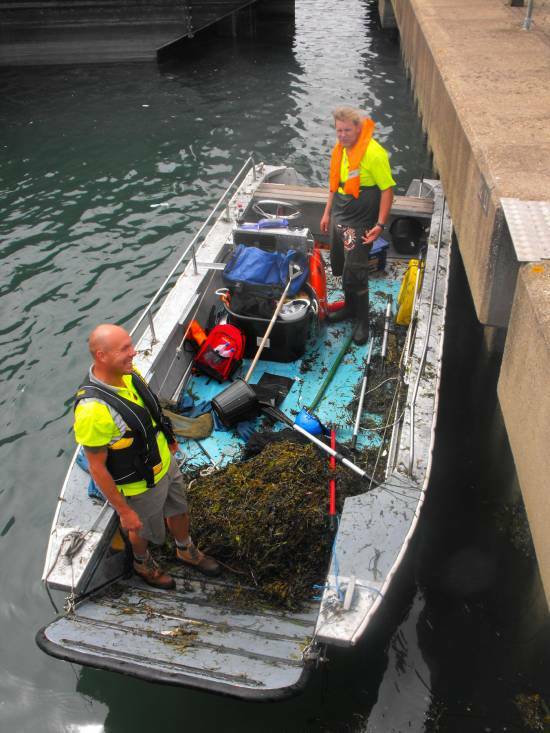 The article refers to the recent report by the Royal Yachting Association that identifies growing concern among sailing clubs that their facilities are being clogged by various types of marine weed. To view the full Marina World article, follow the External website link below. 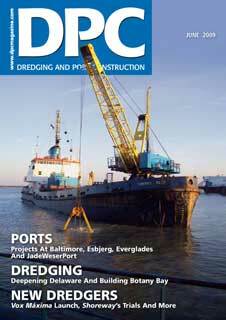 The definitive port maintenance magazine, Dredging and Port Construction (DPC), has acknowledged the quick work of Harbour Clean with a news report in their October 2010 issue. Citing a recent project in a UK south coast port, DPC acknowledged that Harbour Clean shifted over a tonne of floating debris in just two hours. The DPC article also noted the all round capabilities of Harbour Clean’s ’flexible, multi-pronged service’. It has been an ugly mess for far too long but now Fountain Lake, next to the entrance of Whale Island, Stamshaw, has been cleaned up. The lake was covered with rubbish and debris and Alf Horne, president of the Fountain Lake Angling Club, was fed up with forking out hundreds of pounds every year on clearing it up. But after the story appeared in The News staff at Hayling Island-based Harbour Clean decided to roll up their sleeves and get their hands dirty. They spent three-and-a-half days at the lake, clearing everything from crisp packets to discarded needles, filling skips full of waste. And now the lake is a place to be proud of. Mr Horne, 81, said: ’Harbour Clean saw the article in the paper and came and saw me straight away. ’They did a fantastic job, they worked non-stop. He added: ’I do feel better about things now. It (the rubbish) is something I want to see the back of, hopefully it will not come back again. ’People should be more aware of what they are discarding. Despite Portsmouth City Council refusing to take responsibility for the cost of the clear-up, it did contribute [to] the cleaning of the shoreline of the ferry port. But Mr Horne still feels that this is not enough. Harbour Clean, of Northney Marina, hayling Island, contacted The News after the article appeared on August 11, and we put them in touch with Mr Horne. The kind-hearted staff offered their time to Mr Horne, only charging him cost price for the work to be done. Sean Moth, co-owner of Harbour Clean, said: ’We wanted to help and agreed to clear the lake as a gesture of goodwill. I was surprised when I first saw the lake. I didn’t expect there to be so much rubbish. The 28-year-old added: ’It was hard work - I am still recovering now! ’There was a lot of muck and all the rubbish got on top of the seaweed, we had to pull it all out. Portsmouth-based workboat operator, Harbour Clean, reports that a clean marine environment is still a priority for most ports, despite the recent local government cutbacks. Utilising a fleet of small workboats named Nirvana, designed specifically for shallow water (less than 6 inches or 150mm) operation, Harbour Clean engage in a range of activities within the inter-tidal areas of many south coast ports, primarily within the Hampshire, Solent and Sussex boundaries. The highly manoeuvrable Nirvana landing craft is able to clear weed from areas inaccessible by deeper draft vessels. Harbour Clean is based at Northney Marina, Hayling Island and was founded as a family-run business in 2009. The ‘Nirvana’ class landing craft are fully compliant with the SASHMA (Solent and Southern Harbour Masters’ Association) guidelines for workboat operation. Principal dimensions are 6.1m long, 2.3m beam, 150mm draft (light), speed 8 knots, 1.5 tonne (distributed) payload, 2 crew. A full width bow door allows for direct loading of personnel or wheeled plant.